In The Forest you are alone, scared and most probably hungry (also covered in blood and gore). After surviving a plane crash, in which your plane is inexplicably ripped in half and cast asunder, you come around among the wreckage in time to witness a loin cloth-clad humanoid, familiar yet alien, kidnap the unconscious child you were travelling with. This may tell you too much about my psyche, but I immediately discarded any foolish notion of rescuing the child, never gave it a second thought until writing this – kids’ on his own. What kid?! - I ask, bewildered. Save from the cannibalistic natives and the scattered (often dismembered) remains of other plane crash victims, you are alone. The Forest sets a thick atmosphere, a pall of fear and tension that will linger in the back of your mind as you undertake even the most mundane of tasks, like visiting a river or pond to wash the day’s hard earned mud off. You may pick your way through the environment for seemingly hours (though more likely minutes) without being forced to engage the natives. But, misjudge the color or formation of a patch of berries and they’ll cause you just as much pain as the club wielding psychopaths you share the woods with. 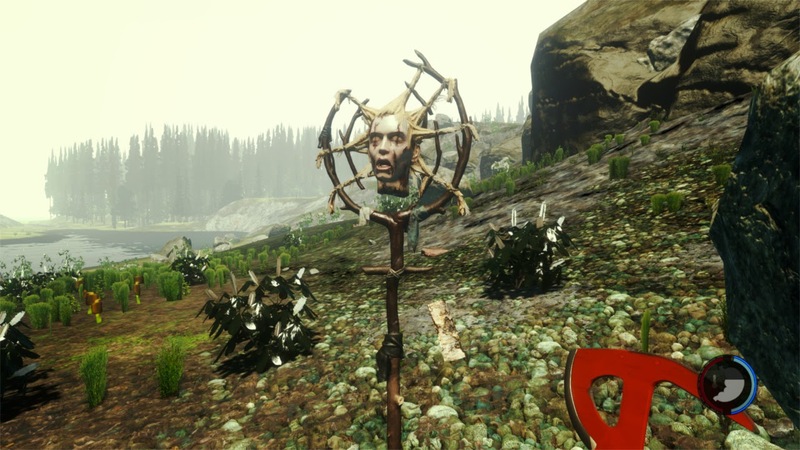 To further enrich the environment, The Forest is scattered with detailed points of interest, such as; campsites and the belongings of other crash survivors, native dwellings, or grisly effigies – trophies of the native’s kills. Which rather ominously often accompany the former. The night is terrifying - also, so is the day. Your goal ultimately, is to survive – seriously forget about the kid, its just easier that way, trust me. 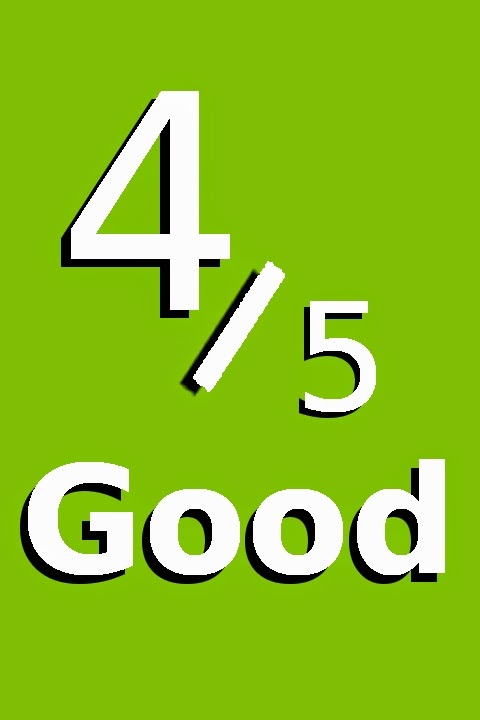 To do so, you'll need to utilize the hints and crafting options within the survival guide. Allowing you to build shelters, walls, fires and more, using basic materials like sticks and leaves. Though much of the handbook is currently unavailable - still in development. You feel a sense of trepidation each time you cut down a tree, because its probably luring your hunters ever closer to you. Survival is all about learning the environment, the systems that govern it, for example; I chose to situate my camp close to the plane wreckage, atop a small plateau; it’s worth noting the plane crash site can vary. Much of the area was already cleared and lizards, rabbits as well a hearty selection of local flora live and spawn on the plateau. Additionally, would be attackers could only approach up three steep slopes, the forth side of the plateau is an unassailable shear rock wall. However, its not at all peaceful living, the camp is slightly further from water than I would like and is dead center between a native village and a cave (which we’ll get to later) - both packed full of hungry locals. Death is around every tree trunk. Much like the native’s abodes, my camp is surrounded by skewered cadavers, however we differ in that my gnarly trophies were claimed from the natives and I have a nasty habit of setting them alight. The dozen or so burning trophies appear to have little consistent effect on the native’s morale however, they prowl my camp perimeter and jump me at every chance. Once, a pair of natives entered my camp and just chilled with me around the fire – I don’t know if this was the effect of some respect or fear system I wasn’t aware of, or simply a bug. The event served to send my mind racing as to the kind of interactions the developers could potentially add to the game as they continue development. Unlike other games in the survival space, such as DayZ, conflict comes from the environment surrounding you, as opposed to other players. This kind solitary tension is rarely evoked by games and is The Forest’s most promising trait. Furthermore, the minimalist interface - health, hunger and energy meters, in addition to the in-world inventory - a pack you spread out on the ground as the time continues to flow around you, all greatly aid player immersion. Nature looks both beautiful and deadly in The Forest. When you die (and you will, many, many times) there is a chance - it appears to be the upon first 'death' in a given game, that you may awake in a deep, pitch black cave. 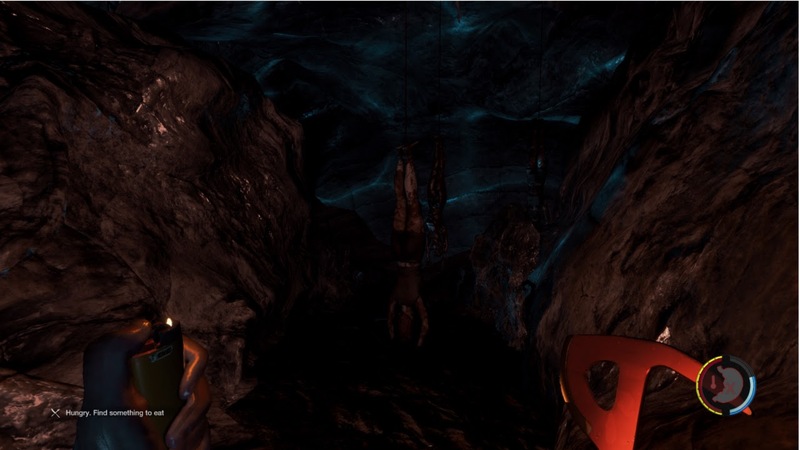 Surrounded by hanging corpses, scantily-clad natives and flailing mutants, you’ll probably die, again. I have managed to escape once, which was largely due to luck – as you can see nothing unless you use your lighter or find a flashlight and using either makes you a much easier target. Escaping the cave felt like a considerable achievement, a result of the intense, grueling nature of the world and it’s inhabitants. 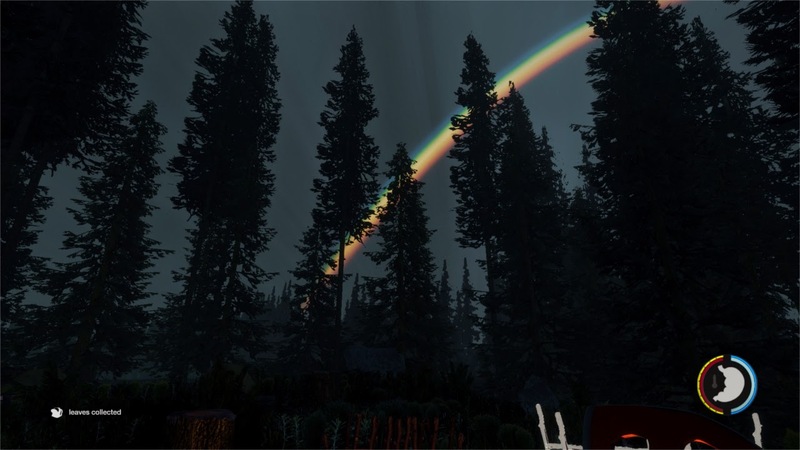 During my time with The Forest I encountered a lot of bugs and visual oddities, they were pretty regular and consistent – no surprise given it is, at the time of writing, an alpha early access game. Such bugs included; my flashlight projecting in seemingly random directions, fish swimming above water and natives suspended, mid animation, several feet in the air. Tip - flare guns are not sniper rifles. 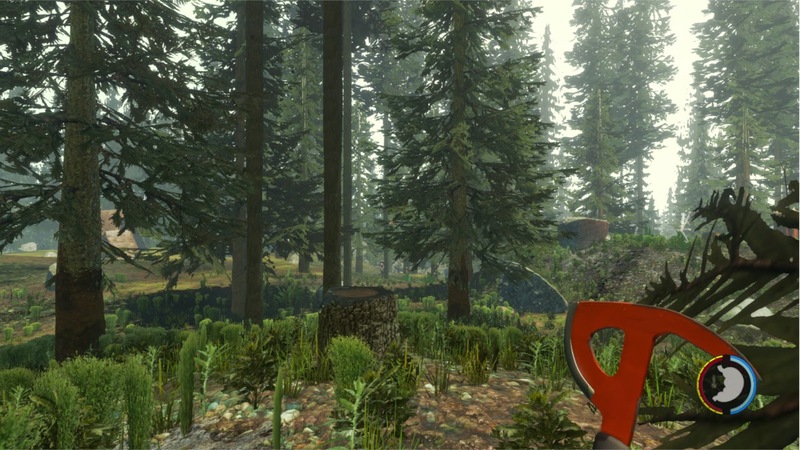 The Forest is filled with bugs - not the buzzing kind and many of the crafting options and systems are not yet implemented in it's very early, early access form. Nevertheless, it succeeds in instilling constant fear and paranoia – every tree felled, fire lit and inquisitive step you take, may break your cover and lead to your abduction and inevitable murder at the hands (and teeth) of The Forest natives.